​Daughters of the American Revolution! DAR is a non-profit, non-political volunteer women's service organization based on documented lineage to someone who fought or gave aid in the American Revolution. We are dedicated to promoting patriotism, preserving American history, and securing America's future through better education for children. We preserve historic buildings and artifacts; provide contests, awards and scholarships; support schools and develop good citizens, while celebrating the exceptional events in our American history. 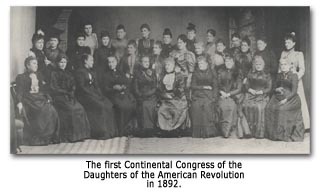 On October 11, 1890, eighteen women and four men met in Washington, D.C., for the purpose of organizing the Daughters of the American Revolution. Their first resolution pledged support toward completing the memorial monument to Mary Washington, mother of George Washington. And so, the first meeting of the DAR was adjourned, having laid the groundwork for a long tradition of patriotic service to the nation. Membership: 170,000 members, 3,000 chapters in all 50 states and Washington, D.C. International chapters are located in Australia, Austria, Bahamas, Bermuda, Canada, France, Germany, Japan, Mexico, Spain, and the United Kingdom. More than 890,000 women have joined DAR since it was founded. Eligibility for Membership: Any woman who is 18 years or older and can prove lineal descent from a patriot of the American Revolution regardless of race, religion, or ethnic background, is eligible. Web hyperlinks to non-DAR sites are not the responsibility of the NSDAR, the state organizations, or individual DAR chapters. Questions or comments regarding this site may be addressed to the site Webmaster.